I recently added a rarely seen S-23 Carving Bar Accessory to my belt sharpener (both from Viel). The extension that allows the belt to run flush with the body is a major improvement, and an unlooked for BIG gain, was the flat surface that allows me to make reference marks, allowing for greater control-repeatability with free hand sharpening. 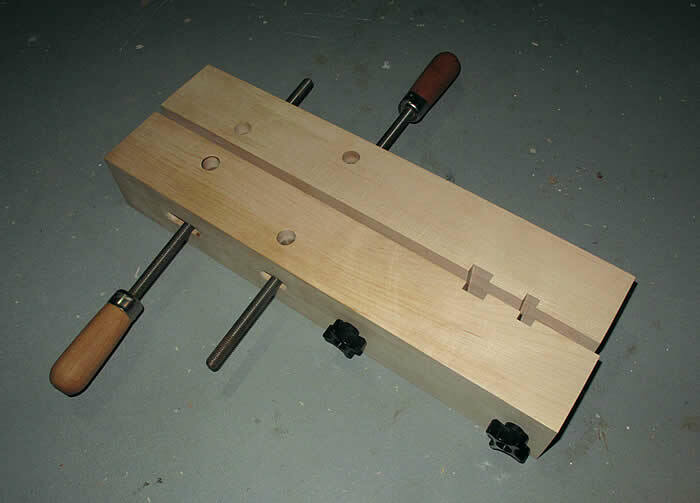 In the setup below, using masking tape to create the references, I able to enable to quickly set and hone a 25degree edge with a 20degress skew on my chisels. Similarily, it is great for straight gouges, like a roughing gougeT. The other accessory that I rely on, to ensure squares on any joinery and setting sharpening angles is the Beall Tilt Box. With the zero function and a good straight edge, it is possible to set repeatable angles, accurately and quickly. 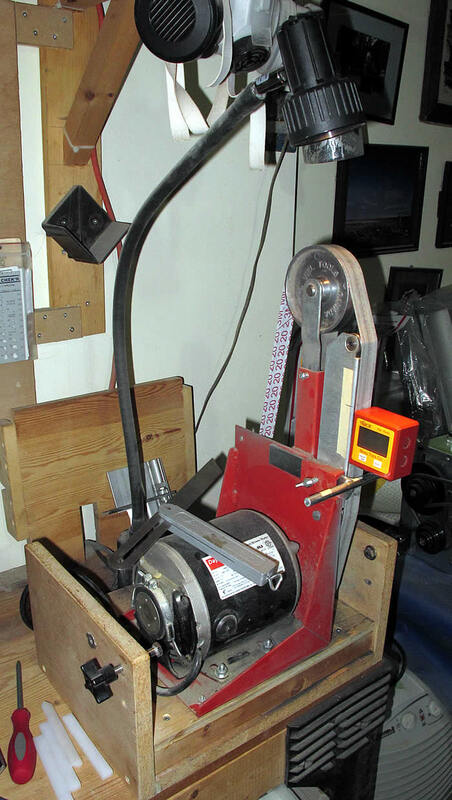 I rely on this tool, as much as I rely on a machinist rule and my Starrett Calipers. No, I do not leave the adjustable angle tool on the motor, but as shown as a reference of s tool I use to set angles, such as the 20 degree sweep on the skew. The screwdriver is always handy to adjust belt alignment. The UHMW bars are used as sliders for the old Viel table. Other changes to my sharpening setup is coming. My standard is Faber Castell Pitt Artist Pen S (0.3mm), F (0.5mm) and M (0.7mm) for a thick line. After applying, allow a week to dry (maybe 2 days is good), but I am allowing the pigment a week to set in my dry box. As I am not a production house, I can wait. Epoxy: ProKote – 2ml CC of A and B, plus 0.5ml of Acetone. Alternate Epoxy: Flexcoat Lite, plus Acetone – small quantities. Aside, I have since acquired some DNA (hard to find in Canada) and it works fine witk ProKote, but keeping to Acetone, given difficulty to locate DNA. For a Traditional Finish use U-40 Perma-Gloss Urethane Varnish, but please note that the pen-ink below are tested for ProKote Epoxy. It is likely that Flexcoat will provide simialr results, but Urethane will not. Pick up a collection of pens and inks that are available (18 in all). The collection were available to me already or references in rod building forums as good instruments. Please note in other tests, I did find a pen of the same make in different colours did behave differently. Yes, there were several experiments before this, trying to get a handle on some of the variables. Paint a wood dowel white and let it cure for a month. Apply a thin layer of ProKote and let it cure for a week. Write on the test rod and let it cure for a week. Apply a think layer of ProKote and let it cure for a week. All curing was done in my Epoxy Box with a temperature around 80F (26C). Examine, recommend and play around with the recommendations. Some pictures, but please note that the one pass of Epoxy meant the epoxy got dirty across the whole blank. Note in preliminary test with Urethane – Blue passed, but black failed. Copic Multiliner Black 0.1 – smears easily until cured, but with patience is good. 0.1 is a litttle too fine. Copic Multiliner Red 0.1 – like red, but tint is weak. Copic Multiliner Red 0.1 – like black and like black worthy of consideration. Uniball Signo 0.7 Gel – works, but was difficult to apply. Move on. Staedtler Pigment Liner 0.5 – application is fair-good, dark and permanent once cured. Faber Castell Pitt Artist Pen S (0.3) – application is fair-good, dark and permanent once cured. 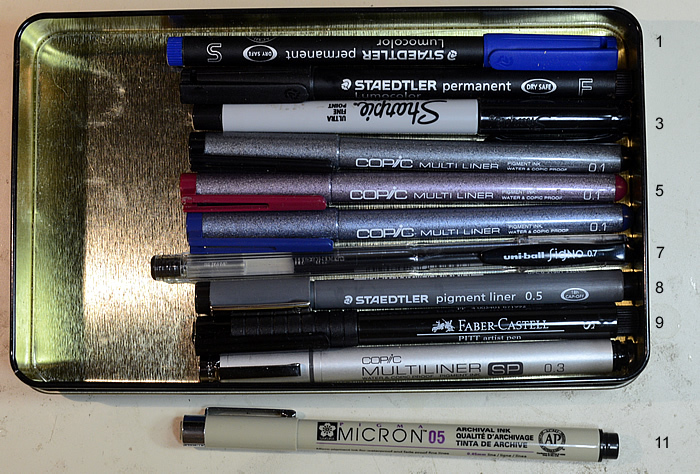 Copic Multiliner SP 0.3 – application is fair, 0.3 is a little to fine, but permanent once cured. Pigma Micro 0.5 – application is fair, but permanent once cured. Koh-i-noor Ink – Calligraphy Pen – difficult to apply and flow, might be ok with a better pen. 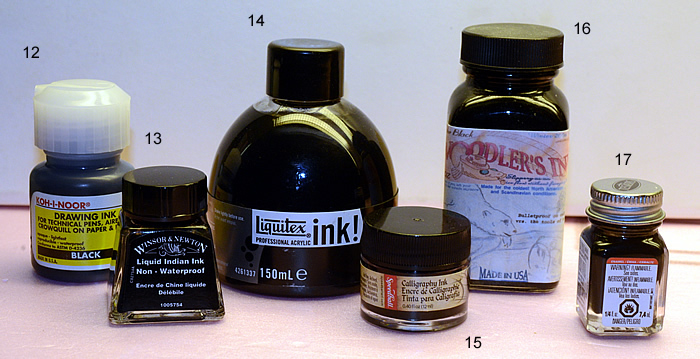 Winsor Newton India Ink – Calligraphy Pen – fair application, a little weak, but permanent when cured. Liquitex Arcylic Ink – Calligraphy Pen – will not adhere – fail. Speedball Calligraphy Ink – Calligraphy Pen – flows and permanent. Coodlers Ink – Calligraphy Pen – will not adhere – fail. Testor Black Enamel – Calligraphy Pen – flows and permanent. Note another Testor colour failed an earlier experiment- Might be procedure or colour. Test Group 2 – Clean your sample with Alcohol before you start. Staedtler Pigment appears to more suscpetible to running from the dirt and grease we transfer by hand. Test Group 3 – The impact of a marker size varies from manufacturer to manifacturer, but you are looking at 0.3mm to 1.0mm depending on effect. The Faber Castell S (0.3) appears to be deeper and darker than Staedtler Pigment Liner 0.5. Copic Multiliner is probably a fine choice and may be disadvantage in my test by using the 0.1mm nibs. What if I was going to play with different colour? I would look at Copic, assuming I can get the pens at 0.3 or 0.5mm thick or Testor’s Paint Enamel, but I would test first. Last note, there is a reasoned argument on a RodBuilding Forum (Link – Post 13) that the current and common use of Acetone or DNA does not serve the chemistry well and suggest a Sherwin-Willians product Polane (r) Reducer K54. Given ease of application and permanance once cures, for black use Faber Castell Pitt Artist Pen S (0.3mm), F (0.5mm) and M (0.7mm). The first alterntive is Staedtler Pigment Liner 0.5 and 0.7mm. Second alternative is Copic Multiliner. Testors Black Enamel Works with a Calligraphy Pen works. Always give the pigment a week to cure. With every change, test it out. Last – compare guide guidelines to some production rods. 3 to 4 wt Traditional Fly Rod: Snake Brand Size 1/0 maximum (0.160). European Nymph Rod: REC Recoil Single Foot Size 2 (0.235). Also exploring Hopkins Holloway Single Foot. 5 to 6 wt Traditional Fly Rod: Snake Brand Size 1 maximum (0.180). 7 to 9 wt Traditional Fly Rod: Hopkins and Holloway Size 1 minimum (0.210). Alternative in Single Foot: Fuji TLSG 8 (0.213) or REC Recoil Size 2 (0.235). 8 to 9 wt Spey Rod: 0.250 minimum, such as H&H Size 3. Whats next? Nothing, enough analysis and get back to doing.